As discussed in the financial press (see articles here and here) and the company’s latest quarterly reports (see here), Inland American Real Estate Trust is the subject of an ongoing SEC investigation. The SEC probe is determining whether the company incurred in any violations of the federal securities laws with regards to its fees, company organization structure, distributions paid to investors, and reported property impairments. Inland American is the largest non-traded REIT with 970 commercial properties and $11.2 billion in real estate assets. Inland American’s last prospectus, dated January 7, 2009 (see here), lists the sizeable fees that are applied to an investment in this REIT. The prospectus is offering 500 million shares of common stock at a price of $10 per share, but only an estimated 88% of the gross offering proceeds would be used to purchase real estate assets. The remainder is to be spent on fees such as selling commissions, marketing contributions, due diligence expense allowances, organization and offering expenses, and acquisition expenses. Moreover, although the estimated total organization and offering expenses are around 12% of the offering proceeds, the prospectus states that the actual fees may be up to 15% of the offering proceeds. Inland American’s organizational structure includes a long list of interrelated entities “that are either subsidiaries of the same entity, affiliates of each other, share some common ownership or were previously sponsored and managed by subsidiaries of IREC [Inland Real Estate Investment Corporation]” (prospectus). These entities serve the roles of REIT Sponsor, Business Manager, Dealer Manager, and Property Managers. The close relationship between key entities involved in the different aspects of Inland American’s business may lead to substantial conflicts of interest. For example, dealers of Inland American shares are paid an estimated 7.5% commission on the share price. These rates are substantially higher than those paid on mutual funds and exchange-traded-funds, which have commission levels of 2-3%. The high fees may lead dealers to sell as many shares of the REIT as possible regardless of their suitability for a given investor. 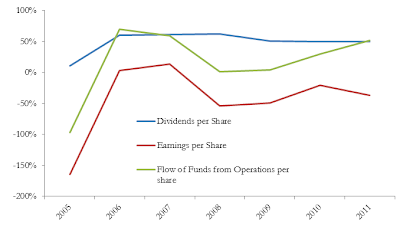 In the past few years, Inland American’s dividend payments have exceeded its flow of funds from operations as well as earnings –that is, its dividend payments are financed by debt as opposed to sources related to the REIT’s real estate earnings. In fact, Inland American’s financial leverage defined as total assets divided by total equity was 234% by the end of 2011. Inland American’s high debt burden may compromise future earnings. Non-traded REITs have reported constant prices per shares even during the recent crash of the real estate bubble. 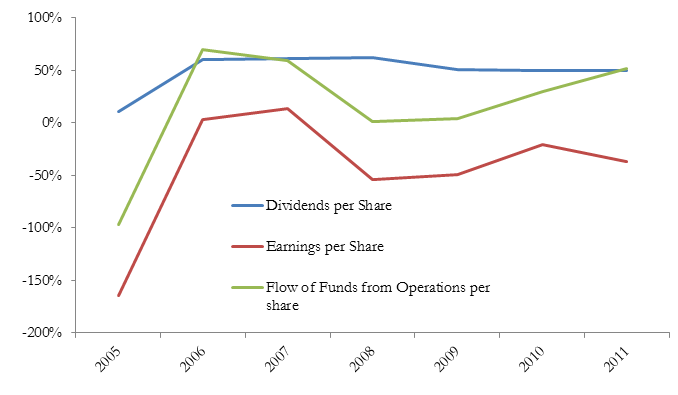 Inland American, in particular, reported a fixed $10 per share from 2005 to 2009. In 2010 and 2011 it reported a price per share of $8.03. Late and partial recognition of property impairments may have allowed Inland American to fix its reported share price at the issue price through 2009, even when real estate prices were on a steep decline in most of the country. The issues of high fees, complicated corporate structure, reliance on debt to fund dividend payments, and lack of price transparency are addressed in more detail in our paper on non-traded REITs (see paper). As described in our paper, these problems not only affect Inland American but are rather commonplace among non-traded REITS. It will be interesting to see whether the SEC expands its investigations to other non-traded REITs.